Getting married is one of my biggest dreams ever and I was over the moon when I got engaged last April (read more here). 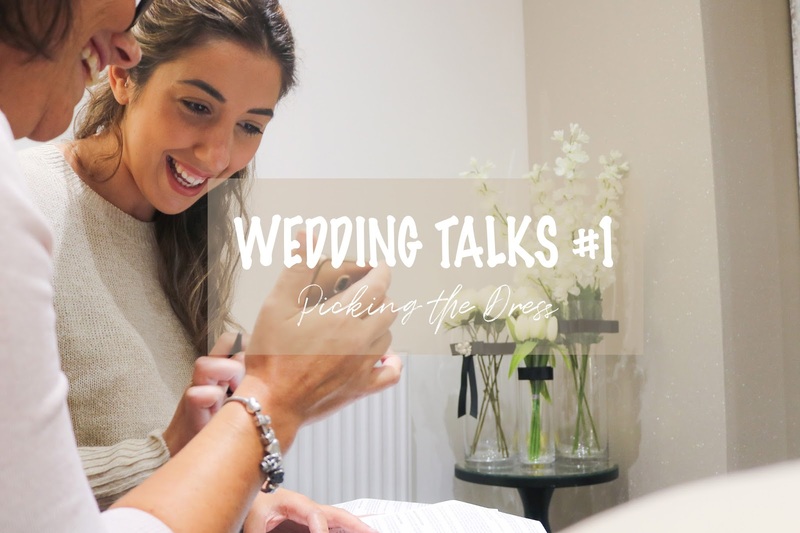 I decided to create these Wedding Talks to share with you the wedding planning process or little moments that I am sure I will love to read back to when I am a few years older. 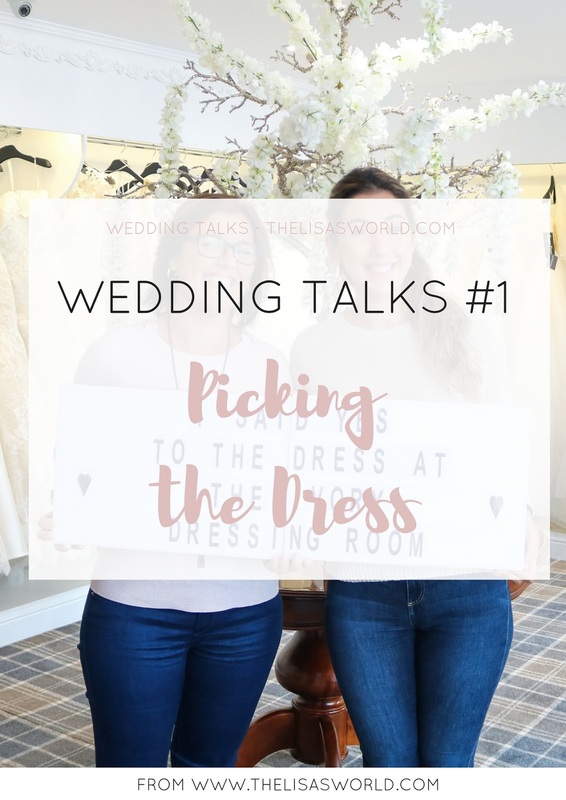 So here is the first post about our wedding planning journey and I had to start with the most exciting thing: picking the dress. We have been together for six years so getting married has been something that I have been thinking about a lot – so much that I thought that I would have my wedding planned by the time I got engaged but oh dear I was wrong. So much detail goes into many different things that it is hard to remember everything even with the best wedding planning notebook you can get. But one of the things I was sure about was the type of dress I would want – or so I thought. 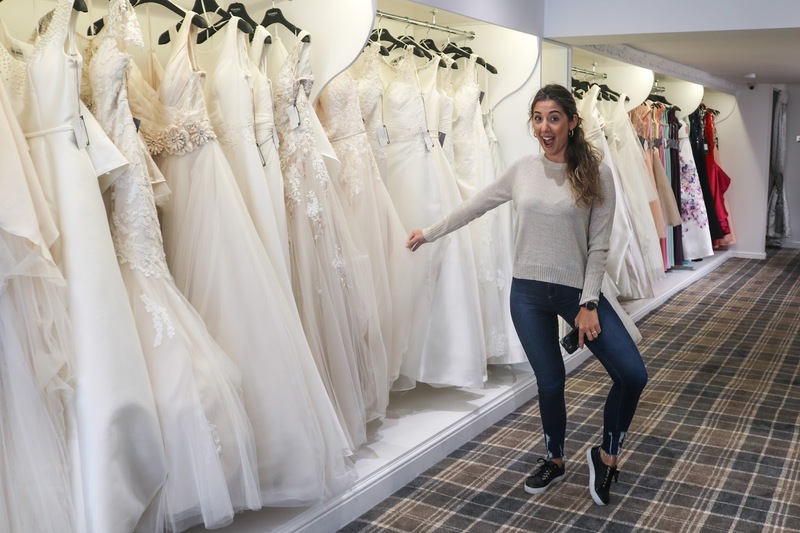 I am well aware I can’t share too much about this special moment as the wedding is still a few months away (219 days to be precise) and my dearest fiancé reads my blog, but I still wanted to have a little reminder of what it felt like going wedding dress shopping. I will hopefully be sharing official photos once the wedding happens. Deciding on how many shops to go or how many dresses you should try (and even styles) is a big, big challenge. I had made up my mind that I wanted to buy my dress in England and not in Portugal so that was one step out of the way. I wanted it to be easy and, in my opinion, the less places you go and the less dresses you try, the best it is. So after looking into it, I booked to go the two different shops on the same day, hoping to get it all out of the way. 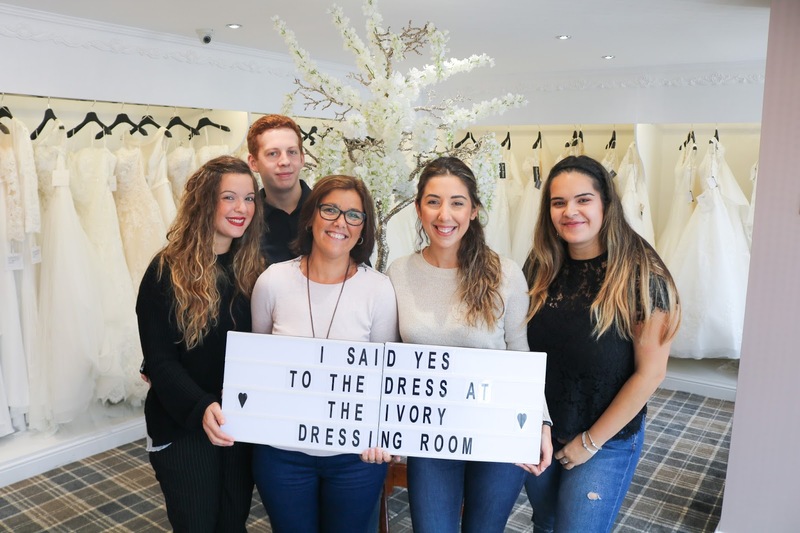 The Ivory Dressing Room was the first one booked so on the 29th of September 2017 I was there, at 10 am in the morning, ready to try on some dresses! 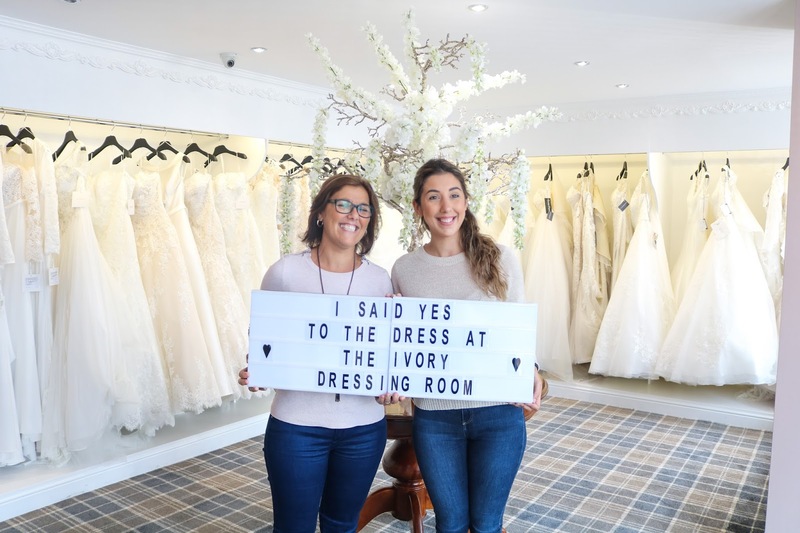 I am glad to tell you that I didn’t even attend the second appointment in the other store as I have found the perfect dress at The Ivory Dressing Room and I couldn’t have had a better experience. I had quite a good idea of what kind of dress I wanted and knew to well describe it. I was lucky to have my beautiful mum with me as well as my maid of honor Juliana and my two close friends Karl and Oriana. When I got to the The Ivory Dressing Room, Brett was very welcoming and quickly made me feel very comfortable to go ahead and pick a few dresses. I had already a budget in mind (that I won’t specify here so my fiance never finds out haha) and so he led me to the ones that were in that range. If you are sure of the type of dress you want, this will be as easy for you as it was for me. In about 15 minutes, I had 6 dresses picked and was ready to start trying them on. As soon as I walked in store, one dress caught my eye and when I pointed it out to my friends and mum they said “oh, I am not quite sure but you can always try it on” and I guess that I secretly knew that that would be the one and so I left it to be one of the last ones to try on.You will be pleased to know that I really liked four out of six, loved two but fell in love with one of them more. And yes, it was as easy as that for me. The first dress I tried on was already a winner. I never thought I would love the first dress straight away, I always thought it was much more difficult than that. Although the first dress was stunning and fitted really well, that special sparkle didn’t happen and I knew that it still wasn’t the one. The one was the 5th dress I tried on – the one I fell in love at first sight as soon as I walked in store. It is funny how things just happen like that! I am well aware that many people really struggle to find the right dress but I felt it was the right one as soon as I put it on. It is much more than I have ever imagined – I have managed to find a dress that combines many things that I love in just one piece. When I put this dress on, I told Brett straight away that I loved it but wasn’t sure if my friends and mum would but I really knew that this dress was the one for me – and I was right. When the curtains opened, they weren’t so surprised and in love as the first dress I tried. I guess it is because this dress is quite particular and slightly different (in a good way, don’t be scared my dear fiancé!). It was something I had never come across and I guess that that’s why they weren’t so sure in the beginning . But I knew and Brett knew that I felt that way so he took the freedom to put the veil on and that was the wow factor. There were tears and laugh when we all realized that that was the dress. I had no doubts at all. That was the dress for me so after a few discussions with my friends and mum, I said Yes to the dress! and my biggest dream was slowly becoming true. I felt so sure of everything that I even cancelled the second appointment and I have no regrets of doing so. I have had such a great experience and I was very lucky that this process was so easy for me. As I said, I was pretty sure of what I wanted and looking on the store’s website/facebook page and looking into what they had in store, designers, etc helped me to do my research and get there with a quite specific idea of what I was looking for (although I still ended up buying a dress that I had never seen before, not even when scrolling down Pinterest for hours). If you are still not sure, don’t worry! Enjoy this beautiful experience. Go to as many shops as you want, try the different styles that you might think it will suit you and have lots of fun! I promise you that when you find the dress, you will know. I never understood when people told me this but it is true. You will know, you will feel it and it will be one of the best moments of your life. If you live in or near Blackpool, please visit The Ivory Dressing Room. The store is beautiful, the customer service is amazing and they truly make you feel like a princess!